Congratulations are in order for Jody Fewster! She was ranked by REIWA as the Number 6 team in all of WA by value sold in 2017. Additionally, she was awarded Number 1 ACTON Sales Champion across all 23 offices for 2017. 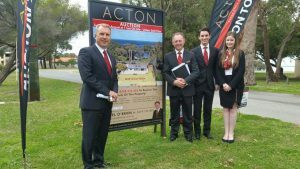 We’re lucky to have such a passionate property agent here in Perth working for ACTON – well done Jody! We recently held our annual ACTON Awards Night, where we celebrate our staff champions around the State. Black ties and elegant gowns glittered throughout the night, as we recognized the talented property agents that make up ACTON. Refreshments and delicious food added to the atmosphere, leaving all reinvigorated for another year. It was a fabulous night enjoyed by all who attended. Our annual Funcats event was held in March 2017. This family friendly event gave us all a chance to unwind and feel the wind in our hair – literally! Sailing on the Swan with one of the best views of Perth’s CBD was a day to remember, and was thoroughly enjoyed by our team and their families. ACTON continues to partner with Funcats to provide great family-friendly experiences on the Swan River. You can read more here.